The Herrell’s in Allston Village has always been a little different from other franchises in the ice cream chain. Other stores have a blue-and-white color scheme. In Allston, the walls are lemon-yellow and hung with local art. Other locations play light pop; this one blasts punk rock. The official Herrell’s logo: two teddy bears sharing a sundae. The Allston Herrell’s logo, now defunct: an ice cream cone shaped like a skull. “It’s always been a maverick,’’ said Marc Cooper, who opened the Allston location in 1984. This year, Herrell’s Development Corp. decided they wanted to bring greater uniformity to their franchises, as part of the company’s effort to expand regionally. But rather than go corporate, the managers at the Allston shop say they have decided to leave the Herrell’s chain and keep their local quirkiness intact. Development Corp. president Judy Herrell, former wife and business partner of founder Steve Herrell, said that as far as she is concerned, the break is not yet official. Nonetheless, a new sign went up last week over the shop at the corner of Harvard and Brighton avenues, proclaiming it the Allston Cafe. The Allston Herrell’s gritty local flavor goes back two decades, Cooper said. “There was a time it was even a lot more raucous than it is now,’’ he said. In the 1980s, a pirate radio station broadcast out of the back room. Rock musicians, bike messengers, and local characters showed up for coffee and stayed all day. Along the way, the managers had skirmishes with the corporate side, such as when it put the kibosh on the logo, which also featured a double entendre. “That was way too much for us,’’ Judith Herrell recalled. And the music was an issue. ’’The lighter music you can still talk over - that gives you a lighter feeling, that reminds you of your childhood, that is better,’’ Judith Herrell said. It’s the kind of music Masse grew up with. She started working at the Allston Herrell’s in 2003, when her husband, Derek Brown, was playing in a punk band whose name cannot be printed in a family newspaper. In 2007, she and Brown arranged a management contract with a purchase option with the franchise owner, Erica Kotin. Last year, Judith Herrell made the decision to start expanding the franchise beyond Massachusetts. The last time Herrell’s expanded, going from a single store to a statewide franchise, was not a success, she said. But she thinks this time will be different. Besides the Allston store, Herrell’s has franchises in Cambridge, North Adams, and Northampton, and recently opened a new franchise on Long Island; so far, Judy Herrell said, only the Allston location has wanted out. She plans to start franchising throughout New England, but has greater aims. “I’m not greedy; I’ll go nationwide,’’ she joked. The new Herrell’s look will involve teddy bears picnicking, a funhouse mirror for children, and pictures of local sports teams, she said. But she stressed she didn’t want new franchises to be identical or soulless. Nonetheless, when word of the new standards came down to Masse and Cooper, it did not sit well. As for Cooper, he was in the midst of renegotiating his contract with Herrell’s, and he found their terms overly controlling: Herrell’s wanted to limit the flavors of ice cream he could sell to non-Herrell’s stores, he said. Judy Herrell would say only that Herrell’s and Cooper “didn’t come to terms, so we chose not to renew’’ his contract. “We wish him luck,’’ she added. So Masse and Cooper decided to secede from Herrell’s. Cooper renamed his creamery Coop’s and is working on developing recipes for new ice cream flavors. The Allston Cafe will carry 10 of his flavors, down from the more than 20 Herrell’s flavors they used to carry, plus the basics. Cooper also plans to transfer the lease and licenses to Masse and Brown, who would become owners of the Allston Cafe. 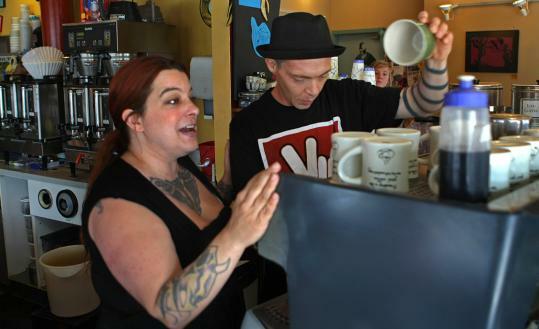 Last Wednesday, counter staff explained the changes to regulars as they bought their coffee and ice cream, as the stereo blared the musical stylings of the band Screeching Weasel. Patrons welcomed the cafe’s declaration of independence.